Belfast is applying the finishing touches to a series of events to mark the 95th anniversary of the launching from the city of the RMS Titanic. The fifth annual 'Titanic Made in Belfast' festival begins on Easter Saturday 15 April and continues until Saturday 22 April. 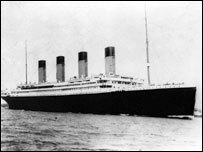 The ill-fated liner, which sank with the loss of 1,500 lives on its maiden transatlantic voyage in 1912, was built at Belfast's Harland and Wolff shipyard. During the Easter week, Belfast City Hall will display 250 Titanic artefacts never seen before in Northern Ireland, which will be auctioned in England immediately after the festival. A wealth of other activities have been organised by Belfast City Council over the week. Meanwhile, the acclaimed 'Titanic At Home' exhibition, has temporarily taken up a new berth. 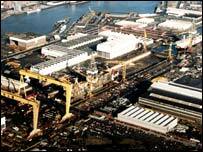 Telling the story of the building of Titanic, and of the people who built it, the exhibition this year will be staged at W5, the interactive discovery centre at the Odyssey Pavilion - just a few hundred yards from where Titanic itself grew majestically on the Belfast skyline 95 years ago. It focuses on the creation of the ship, telling the story through the eyes and words of the workers who put a piece of themselves into the ship and those who sailed from Belfast never to return. 'Titanic The Image', a major new exhibition, is being staged in partnership with the Ulster Folk and Transport Museum. It will look at the enduring myths around the ship and how it has become a key icon of international popular culture and one of the great metaphors of our time. Visitors will be taken on a journey of images charting the three stages of Titanic's life: its creation in Belfast, its fateful maiden voyage and sinking, and its 'afterlife' as portrayed in paintings, films and other visual representations. Belfast Lord Mayor Wallace Browne said the Titanic story was both fascinating and poignant. "For too long, Belfast's part in the Titanic story, and the role of the people of Belfast in bringing Titanic to life, has been neglected," he said. "Over the past few years, the city that gave birth to the ship, and many others, finally and rightfully acknowledged her part in the tale, and Belfast City Council once again is proud to celebrate the achievement, commemorate the tragedy and educate the world about our city's role in the Titanic story." This year's festival, which has been organised by Celebrate Belfast, is dedicated to the memory of John Parkinson, president of the Belfast Titanic Society, who passed away at the age of 99, on 1 March. More details of the events can be obtained from the Belfast Welcome Centre, by calling +44 (0) 28 9024 6609, by email from events@belfastcity.gov.uk, or online at celebratebelfast2006. # posted by SAOIRSE32 : 5:53 a.m.